Objective: The objective of this citation study is to understand the use and influence of the concept of a controlled vocabularies in Geographic Information Science (GIS) as part of a larger goal to distinguish information science from information technology. Methods: Articles with pre-selected descriptors that represented the concept of controlled vocabularies within GIS were selected from GeoRef and validated in ISI indexes. Bibliographic coupling and content analysis of the article titles were used to draw clusters and understand the influence of the concept of controlled vocabularies in other discipline such as the geosciences. Results and Conclusion: The results from this analysis provide one perspective of the LIS sub-domain of a controlled vocabularies as represented in GeoRef and used in the context of GIS research and scholarship. Findings are used to suggest future research directions to address issues related to better understanding of the concept of a controlled vocabularies and the provision of knowledge organization tools that will promote interdisciplinary understanding. The creation of special, more-finely grained in-depth classifications and thesauri for the concept itself, namely, a controlled vocabulary is recommended. 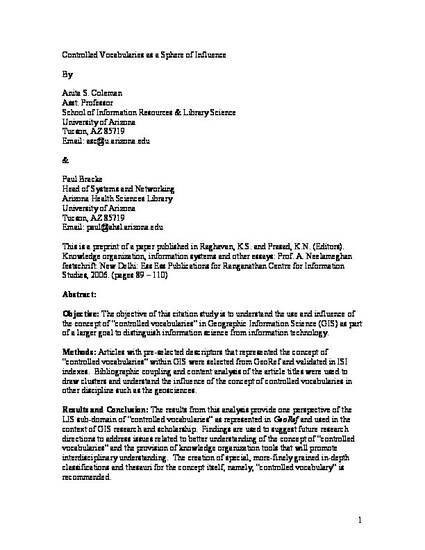 Raghavan, K. S.; Prasad, K. N.
This is the Submitted Manuscript of an article that appeared in Knowledge organization, Information systems, and other essays, pg 89-110, 2006.